John McCain, 2013, describing why Hillary Clinton skated out of a full day of Benghazi hearings. She obviously has an adoring media. You could make the same point by presenting any yearlong schedule of Sunday show appearances – every year, McCain dominates. One reason why McCain’s dogged campaign against Susan Rice got so much coverage is that the media parkours over walls to cover the senior senator from Arizona. Former presidential candidate goes to war against guy who beat him twice – a great story! Here, McCain’s slapping the media for something that wasn’t the media’s fault. 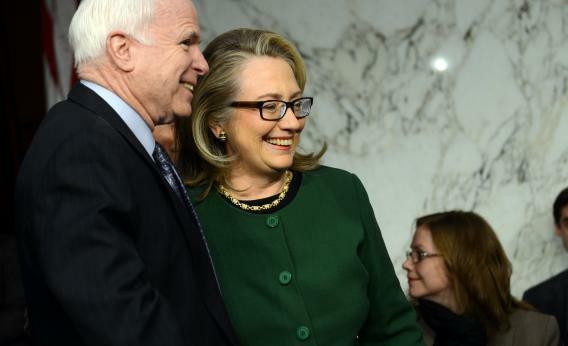 After four months of fulmination, McCain’s time with Clinton was a near-total waste – a frustrated speech, embedded with questions, that gave Clinton time only for one evasive responsive. My wrap on the hearings is here.